The daytime talk show The View scored a big interview this week  none other than the President himself. As Barack Obama's interview airs, TIME takes a look at other moments in history when the POTUS came face-to-face with popular culture. He was the first U.S. president born after World War II and admitted to trying marijuana and having had marital difficulties. Thoroughly modern Bill Clinton was a natural ally of the MTV generation, and Generation X was vital to his 1992 election victory. Once in office, Clinton looked to make good on his promise to keep in touch with America's youth on issues like teen violence. 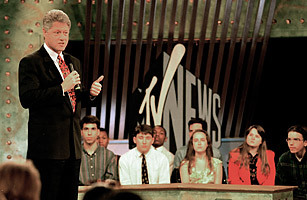 Amid talks of a national crime bill, spectators were caught off guard when Clinton chose not to exercise executive privilege while taking part in an April 19, 1994, Enough is Enough town hall sponsored by MTV. After being asked, "Is it Boxers or Briefs?" Clinton laughed, and conceded, "Usually briefs."